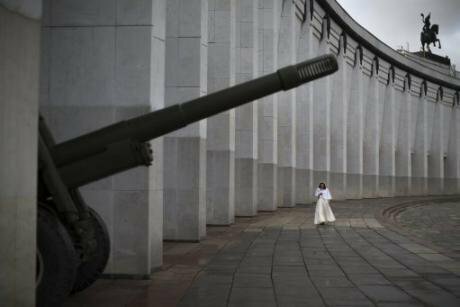 Poklonnaya gora, Moscow — between memory and militarism. (c) Alexander Zemliachenko / AP / Press Association Images. All rights reserved.This essay is the first in a series by Kirill Kobrin on the death of the post-Soviet project. Stay with us for further instalments. As the end of 2016 looms, you can’t help but look back and discuss what’s happened. You make acerbic jokes about Trump, sigh over Brexit, and hope that Germany’s post-war immunity to brazen populism remains intact. Eventually, it becomes obvious that these topics are, at least, worth discussing — as opposed to the situation in Russia. Russia is boring because, well, everything about Russia is clear. Having said that, what does “clear” mean? At first glance, the situation in Russia is growing stranger and more dangerous: fairy-tale like parliamentary elections, musical chairs in the government, the bombing of Syria, the death of the liberal opposition, the pathetic helplessness of national legislation when it comes to Chechnya, and so on. Add an economic crisis, growing working class discontent, the slow-motion failure that is “import substitution” — all of this is just the dull background for bigger dramas taking place beyond Russia’s borders. Why? Because all of these unpleasant things have their roots in a previous period of history. I am convinced that the period of history known as “post-Soviet” in Russia is over. This is why the personalities and processes of the previous period are no longer relevant. They are still in the news, and they still act, sometimes dangerously, but discussing them is as relevant as discussing laws passed by pre-revolutionary premier Pyotr Stolypin in 1919. Today’s changes aren’t as quick and catastrophic as they were then, but then history doesn’t repeat itself, not even as farce. What has changed? The public agenda. The hierarchy of what’s important and what’s not for Russian society. What is appropriate and desirable. And, most importantly, the project of the present and the past. The old post-Soviet project, once relevant back in 1991, is over. It has achieved its aims. It’s just that nobody’s rushing to pronounce what has happened as the “natural, logical results” of this process. Maybe now it’s time to sum up (tentatively, of course,) the results of Russia’s post-Soviet project — this is what this series of essays is devoted to. The post-Soviet project began with a public gesture of rejection of Soviet ideology. It ended when it drowned in the pseudo-ideological swamp of conservatism. Ideology, culture, public life in general, these are the things we must concentrate on to understand what happened in 1991-2016. In this introduction, I will look at the history of Soviet ideology, which was allegedly spurned by the freedom-loving Soviet peoples in the late 1980s, and which supposedly formed the foundation of the “Soviet empire.” In the next part of the series, I will discuss what happened to this ideology, discuss the possibility of new ideologies, and draw some conclusions about the state of the public mind in modern Russian society. If you ask people who were old enough to consciously experience the most impetuous and troubled period of the late Soviet Union — the three and a half months in 1991 between the failed August putsch and the Belavezh Accords — about what role Soviet ideology played back then, they will all answer much in the same way. Soviet ideology played no role. And nobody “did” anything with that ideology in mind. The object (and content) of political struggle in Russia, Ukraine (which left the Union on 24 August, 1991), Belarus (which did not leave the Union until after Belovezh), Turkmenistan (left 27 October, 1991), Tajikistan (9 September, 1991), Kazakhstan (16 December, 1991) and Kyrgyzstan (31 August, 1991) was the national independence scenario, the status of the republics, the future of the USSR, of how the parent state viewed its surroundings — it had nothing to do with Marxism-Leninism. On one side of the barricades (thankfully, mostly rhetorical), there were speeches on Russian colonialism, Moscow’s imperial mind-set, and the unmatched qualities of the titular peoples of the respective republics. On the other side, there was talk that Russia “feeds” everyone, and that nations A, B, C and so on never existed to begin with. That these nations were inorganic administrative units, that their languages were just dialects of more important languages, that the great Russian culture far outstretched “local” culture. This rhetoric is typical for the breakdown of a multi-national empire and the building of ethnic nations grounded in modern realities —you could hear such talk in Hungary in 1848, Poland of 1918, India of 1947 and so on. This is a phenomenon of modernity, of the period which the previous generation of historians called “Modern history”. The thing is, the fall of the USSR feels like an event from a different epoch. The end of the Soviet Union is seen today as the end of an ideological project, the fall of communist ideology, a postmodern event — most explanations of what happened in 1985-1991 say this. My task here is not to introduce a new concept of how the USSR fell apart. This is a separate topic of discussion. What I’m interested in is this: how did the “absence” of Soviet ideology in the events of 1991 and, if you think about it, in the events of the previous two-three years, influenced its continuing absence in the 1990s, and how this absence influenced the current Russian regime to remodel (or even reconstruct) this ideology in the last 16 years. This is no idle question. If dealing with a society that, due to unknown reasons, “lost” an all-powerful ideology, the desire to fill the ideological vacuum is understandable. In that case, the ideology-building of the Putin years acquires the qualities of a natural process. If there was no viable ideology when the USSR’s allegedly “sudden collapse” took place, then talk of an ensuing “ideological vacuum” in Russia makes no sense. Then we can claim that the post-ideological epoch began on the territory of the former USSR earlier. In this case, it is beneficial to look around Russia, as opposed to peer at its Soviet history — the current happenings in Europe and the US give us much food for thought. For the 70 years that the Soviet state existed, what was “Soviet ideology?” It’s no secret that, in this case, it is difficult to speak of just one ideology — there were several successive ones that had the same name. The foundation of the history of Soviet ideology is clearly classical Marxism-Leninism, which combined the utopian vision of a future classless society with effective political instruments for practical adaptation. 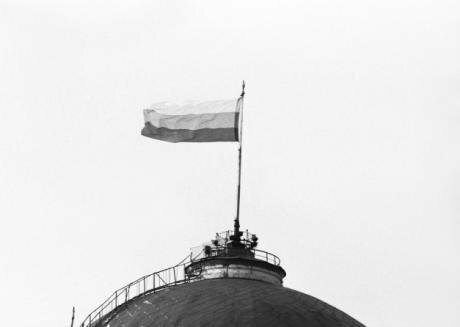 The Russian tricolour is raised over Moscow on 1 December, 1991. Photo: Valentin Kuzmin / ITAR-TASS / Yeltsin Center. Some rights reserved.But unlike the Marxism of the mid-19th century, Marxism-Leninism was not eschatological. Lenin did not prophesise that “history will end” after communism triumphs. The classless society of the future would be created, it was said, and then not only the character of human society would be changed, but human nature. Lenin avoided futuristic visions, and made do with ascertaining that there will be no class under communism, no exploitation, and no private property, and only that will result in universal justice. Lenin rarely used the word “happiness”, which can be found frequently in the works of the utopian socialists of the 19th century, as well as his romantic contemporaries and allies in the main revolution of the 20th century. The main theory of Marxism-Leninism, the starting point of the history of Soviet ideology, was the idea of universal justice, which was treated as something mystical, even religious, though to Lenin this seem like a practical concept. In order to reach this daring, but, as the Bolsheviks saw, attainable goal, the old world in all of its economic, social, political, and cultural foundations had to be destroyed, so that a new world could be created on a new foundation. Debates mostly concerned the means of reaching this desired outcome. Lenin’s point of view, which combined the most practical methods with merciless pursuit of the utopian end goal, won out. Tactically speaking, Lenin was ready to sacrifice a lot. But he never overstated the importance of the transitional measures and institutions that had to be tolerated (or introduced) so the Bolsheviks could retain their grip on power and the country could continue on its path to communism. Peace and trade with the imperialists instead of a global revolution. New Economic Policy, or NEP. Giving land to peasants for individual use. Using “fellow travellers” in science, industry, and culture (or propaganda, to be exact), in the government apparatus and in the army. Finally, there was the recognition of national movements as “revolutionary allies”, with all of the conclusions for policy this entailed. If we look at “Soviet ideology” circa 1984, right before the beginning of perestroika, we will see that pretty much nothing of Marxism-Leninism remained. Soviet ideology had undergone a grandiose transformation. The principal loss during 70 years of Soviet rule was the idea of creating an absolutely just society — this was why the state and its citizens existed, after all. And this idea was lost long before the Soviet Union was also “lost”. This article was translated by Natalia Antonova. Read the next part in this series of essays on the death of the post-Soviet project here.